Due to my Gastro referral still being in the pipelines, I decided it was probably a good idea to still attend my outstanding appointments at Good Hope. 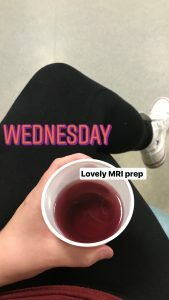 So despite living 90 miles away, I made the journey back home on Tuesday for my clinic appointment with my consultant and the pending MRI scan the following day. One miserable train journey later, I was at Good Hope; primed to talk IBD and my health’s current state. I won’t lie, moving away from home has been stressful and turbulent at times, I haven’t always been 100% on track. Which means some days have been goddamn awful and I’ve been off sick from work, much to my own disappointment. But I’ve gotten a thicker skin, I’m mentally stronger these days with my ostomy so I know that my sickness is real and not at all fake. It helps that my employer is incredibly understanding about my health condition and the situations I am and will face. I explained to my consultant my two bouts of dehydration, one partial blockage and one stomach bug saga and he looked quite impressed. “How are your IBD symptoms?” he asked. Well, to be honest, I hadn’t really thought about my IBD for such a long time, I had to take time to pause and really think. The IBD has been non-existent really since the Vedolizumab was stopped at the start of 2017. My issues since have been entirely ostomy related, solvable by changing my lifestyle and supplies. I must have been thinking for a while because he prompted me again, “Is everything okay?” – and yes, yes it is! I said that I was struggling to remember any IBD ‘things’ and this is a good thing. We touched on continuing to see how long I could go medication free and what would be out there if I did need something. “Probably back to biologics but we know that Vedo would work again and we have Stelara now too to consider” which gave me much joy. Having options at this point when I don’t need them desperately relaxes me. I asked my consultant to write to Peterborough and get me into a see a GI once my MRI scan results were reported on, as my disease has a tendency to flare up without much warning. And as much as I am enjoying this period of remission, I am realistic in knowing it could not be here forever; being prepared is key. My old consultant gave my current consultant some advice about me: “She is trouble, treat her with caution” – meaning my IBD can becoming aggressive and why that happens we just don’t know. He has seen that first hand, for all of last summer this was the case, so I trust him to explain my condition in real terms to a new GI. This was my seventh MRI of my small bowel since my diagnosis in 2011. Three of those have happened in the 12 months. I am some what used to them, but I now have my ostomy. This allows some certain wiggle room: Without my colon, the prep I have to consume will dehydrate me. But good prep is needed to get clear images of the state of my small bowel. 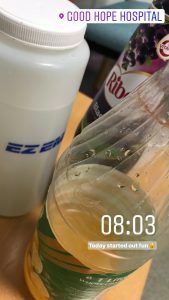 So the balance is taking the right amount of prep – scaled down from 1lt to about 550ml consumed over 1 hr instead of the usual 45minutes. I managed about 475ml by the time my bag was filling up and I needed to be cannulated. One tiny blue needle later, one dose of Buscopan and the scan started. Two-thirds of the way through the 40 minute scan, they released the fluorescent dye into my system to help outline my small bowel. The scan I have no anxiety or nerves about; I’ve had so many I find the vibrations and sounds of the machine quite relaxing. The aftermath of said scan with an ostomy can be problematic. I expected a flood of watery output and this did indeed happen. Journey time from hospital to home is roughly 40 minutes and my bag was heavy with output on my arrival home. I took an Imodium, grabbed a isotonic drink and plonked myself in front of the TV in my pjs. For the rest of the day I monitored my output and dealt with my electrolytes with fluids and rest. I did feel abit dehydrated but otherwise I was okay. My bowels did insist on making an orchestra of sounds but this was probably down to not eating for 12 hours prior to my scan. I have been struggling with my fatigue the last week or so, my body feels completely drained of energy, let alone when you take away food as a source of energy; I was so so tired. We now await the results; which can take up to a month. Fingers crossed I am able to see a GI in Peterborough sooner than I get a repeat clinic appointment with my current consultant. But having that safety net is reassuring. Next Post When Does Having an Ostomy Feel “Normal”?